Today’s marriages are failing at an alarming rate. But what if we discovered the way to experience true intimacy with our life partner? In The Joy of Intimacy, Manis Friedman shares timeless Jewish wisdom in creating a meaningful and lasting relationship with our spouse. Much of Friedman’s advice is based on orthodox Jewish teaching on marriage. These include proper modesty, relations only at certain times of the month, and an emphasis on creating a baby as a result of the marriage act. But Christians (and especially Catholics) would also relate to many of these concepts. God gifted the married couple with these pleasures, and He wants our marriage to be alive, fresh, and fulfilling. Following this advice would be the perfect start in growing closer to each other. The Joy of Intimacy would be a great resource for all couples starting out in their marriages, as well as those who may have hit some snags along the way. I highly recommend it. Reading the Old Testament from start to finish is a monumental undertaking which few kids would ever consider. But The Oldest Bedtime Story Ever presents much of the story in an abbreviated and fun read. Using paper cutout images, author Benjamin Morse crafts a unique book that highlights many of the more interesting Biblical stories. Beginning with Adam and Eve, Noah, and the patriarchs in Genesis, he takes us through the Exodus, the time of the judges, the Davidic and divided kingdoms, the exile, and the return from exile. Other important figures like Esther, Jonah, Samson, and Ruth are also featured. This unique book is told with lightness and humor. For example, in the story of Adam and Eve, Morse states, “Life was so perfect and free of any troubles, they hardly knew what to do with themselves.” These brief commentaries made me chuckle, but also think more deeply about the scenes presented. Since no vignette is fully developed, this book might also encourage youngsters to delve into the actual Bible story for a better understanding of what happened. I wasn’t sure what to expect from this book, but I was pleasantly surprised at its substance and accuracy. Anyone (not just kids!) who wants a nice overview of Bible history would do well to pick up a copy of The Oldest Bedtime Story Ever. It’s not only an enjoyable read, but also a great study book, since all scripture references are listed in the appendix. For those with hand-held devices, there is also an app available. In 1944, Cantor Leo Fettman and most of his family were forced from their home and sent to Auschwitz. Cantor Fettman was the only one who survived. 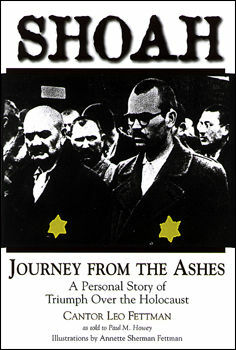 In Shoah: Journey From the Ashes, he shares his story of torture and survival as a remembrance to all who perished. Fettman explains that anti-Semetism in Europe was nothing new when Hitler came to power. Jews had faced centuries of persecution, and it was easy for Hitler to blame them as scapegoats for Germany’s problems. But it took more than one madman to exterminate 6 million Jews. European Christians willingly followed his orders and other nations stood by and watched. They were just as guilty. And there are those today who deny the Holocaust ever took place, claiming that the Jews made it all up. Hearing about the horrors of the Holocaust is difficult for most people. In facing what humanity did during the time around World War II, we also have to face what we’re doing today. Many ethnic groups and others face discrimination and outright violence when people don’t understand them and determine they are the enemy. If we want to survive as a peaceful nation, everyone should read this book and learn these important lessons from the past. Isaac Millman found himself alone in Paris in 1942, at the age of nine. Both of his parents had been captured and sent to Auschwitz, and he would never see them again. Now a grandfather, he journeys back to Poland to see the last place his parents were alive. Bringing his two grandsons with him, he tours the facility known for some of the greatest atrocities ever committed. As the tour guide shows them around, Millman captures the images with watercolors. Some are bright, where flowers have grown to hide what happened so many years ago. Others are stark black and white, depicting prison cells, the crematorium, and his father’s death certificate. Millman takes this journey for emotional healing, and he pays his last respects to his parents at Auschwitz before he leaves. And in honoring them and attempting to let go of the past, he shares his story with others, making sure that no one ever forgets the horrors of the Holocaust.